GB short-track skater Elise Christie won her first World Cup medal of the season on Sunday, a day after an on-ice crash nearly ended her Olympic hopes. Christie, a top British medal hope for Sochi 2014, took bronze in the 1000m at her final Olympic qualifier in Russia. She had earlier "thought her Olympics were over" after being involved in a three-way collision on Saturday. "Luckily, it's just superficial injuries," British performance director Stuart Horsepool told BBC Sport. "It's the worst-case scenario that your main athlete gets injured and it could have been a career-ending injury." This weekend's World Cup, in Kolomna, doubles as the second of two Olympic qualifiers for the Sochi Games in February. Short-track involves four to six skaters racing each other in laps of a standard ice rink, in a sport which shares similarities with track cycling's keirin and ski cross. Competitors must progress through knockout rounds into the final, then the first over the line wins. Outright speed is no guarantee of winning a race - short-track is an intensely strategic sport where positioning is vital, making sure you are in the right place to seize split-second opportunities as you dash for the line, without exhausting yourself at the front for the whole race. Collisions are fairly common. You can be disqualified for impeding a rival or unsportsmanlike conduct, or automatically advanced to the next round if you were unfairly disadvantaged in your race. Elise Christie races in all three individual events - the 500m, 1000m (in which she has topped the world rankings and won a world bronze medal) and 1500m. That translates into 4.5 laps for the 500m, nine laps for the 1,000m and 13.5 laps for the 1500m. Those distances are the same for men, who also race in a 5,000m (45-lap) relay, while there is a 3,000m (27-lap) relay for women. Christie did enough at the first qualifier, in Turin last week, to effectively secure three berths for Britain at the Games. The Scot was the world number one in the 1000m event for much of the past two years, and won world bronze over the distance earlier in 2013. While a bronze medal in Kolomna makes little difference to Olympic qualification, it marks a strong comeback after a shaky Saturday. "On the last lap, a Korean skater stumbled and fell into the barrier, and Elise fell into her," said Horsepool of the crash, in Christie's 1500m semi-final. "An Italian fell into both of them and the Korean's skate went into Elise's leg. She's got two cuts and quite a big bruise - the blade scraped the skin, like being on asphalt. "All the doctors and medics jumped on, it was quite a bad pile-up. Elise went into a bit of shock, she thought her Olympics were over. It was a massive fright for us all." Both British relay teams are set to miss out on the Games after failing to secure the top-six places in Kolomna which were needed to keep their hopes alive. There has never been a British women's relay team at the Olympics, but the men's relay squad are previous holders of the world record and have won World Cup medals in the past. "The men ended up with three of the top four teams in the world in their heat," explained Horsepool. "We were within half a second of getting through. We were good, but not good enough to cope. "It was pretty devastating. The guys are very disappointed and we have some tough decisions to make about who goes to the Games." 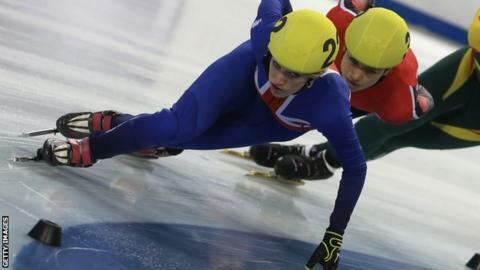 The International Skating Union is expected to release the final quotas for Sochi 2014, which will detail how many places British skaters have earned, in late November or early December. Unofficial British calculations suggest Team GB can expect three men and two women at the Games. Both relay teams qualifying would have handed Britain the maximum 10 places. "It's been traumatic but it's not a disaster," said Horsepool. "Our medal hopes are still intact."